The Salvation Army Fond du Lac has enrolled 23 families in the Pathway of Hope Program. 94% have reported an increase in stability; 52% have reported an increase in parental income, of those, 75% more than doubled their income; and 57% reported an increase in hope. Dorya and her four children were homeless when they entered The Salvation Army Fond du Lac and The Pathway of Hope program. Dorya worked hard and listened closely; she found full time employment, a home and childcare. Then, Dorya discovered she was pregnant with her fifth child. The pregnancy was complicated and the baby arrived early, weighing 2 lbs. Though the newborn's needs threatened her progress, she kept her chin up and kept going. Her courage and determination was a good life lesson for her children and community to learn. The Salvation Army's free, intensive case management program that unites community resources with Salvation Army programs and offers eligible families with child/ren under 18 a holistic approach to building stable circumstances for themselves. Our expertly trained Social Service staff works one on one with enrolled families, helping them uncover and understand the weights keeping them down, then map out and take action steps to achieve higher levels of self-sufficiency. Pathway of Hope builds more than economic resources; it ministers to spiritual needs and strengthen the lives of the children through character building and youth programming. "Since I joined Pathway of Hope, I've held a job for nearly a year! I've set goals and achieved them all. I've been financially stable and strong-minded! I've had a complete change of attitude and become the person I really wanted to be!?" "Pathway of Hope has really helped us focus on the goals we have for our family...they help you not give up on yourself, they believe in us and help us stay positive and keep moving forward..."
"With your help we tackled the problems in our lives and have come out on the other side, better than we were? When we felt as if the walls were closing around us, you were there for us. You helped us find ourselves?" In April 2017, Captains Steven & Telinda Wilson accepted The Pathway of Hopes most prestigious award. 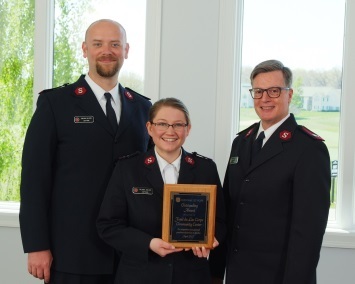 The Fond du Lac Salvation Army POH program was recognized as one of the United States Outstanding Pathway of Hope programs. Community support fuels achievements like this. To learn more about the Pathway of Hope program, contact The Salvation Army Social Services Department at (920) 923-8220 or by email at FDLSAinfo@usc.salvationarmy.org. Thank you. Together, we're "Doing the Most Good" for Fond du Lac County.